SANTA MARGHERITA FIRE DEPARTMENT – Through the years, certain rules have come to the forefront that increase scene safety and provide for a more efficient extrication operation. The Golden rules are applicable in every operation and should be followed with out question. These rules provide a solid base of operation for those firefighters who are less experienced with extrication and, if followed, will minimize the possibility of injury to the crews performing these operations. It is assumed that all vehicles will have, at a minimum, primary stabilization in place, even though the situation may not require any extrication. These rules are for the actual hands on extrication evolutions, but are also applicable to primary or secondary stabilization situations. 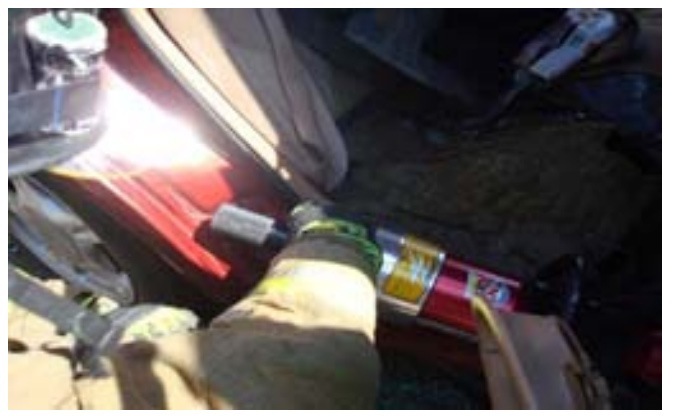 1 In this picture, the firefighter was making a relief cut to the bottom of the B-post when the tool started to shift into the vehicle. Leaving the hand between the tool and the vehicle increases the possibility of the hand being trapped and injured. The hydraulic tools that we are using operate at tens of thousands to hundreds of thousands of pounds per square inch of pressure. These tools have the tendency to shift or rotate one way or the other once they have gotten their bite on the vehicle. If this happens, and the tool operator is not aware of the potential danger, the tool will shift and can trap one or more of the operator’s body parts between the tool and the vehicle. Due to the extreme forces being exerted by the tool, it can be very difficult to free the operator. If lucky, simply operating the tool in the opposite direction will free the trapped body part. However, in some circumstances, a lot more force may be required. Often times, operating the control handle is not possible because the handle or lever has been pushed into some part of the vehicle body in a manner that will not allow it to operate. 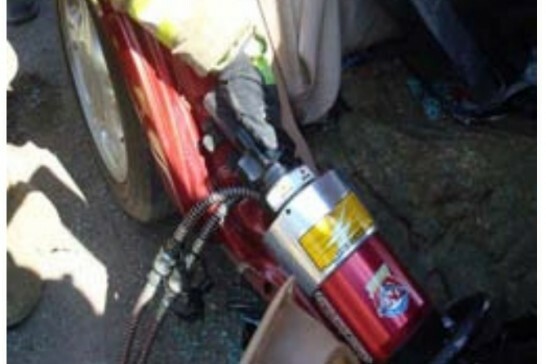 The only way to free the rescuer then would be to pry the tool from the vehicle, which may require significant force. Any part of the body can be susceptible, but the most common body parts to become trapped are the hands and the legs. This is because the tool operator’s attention is usually fixed on the working end of the tool and not on the entire process or is not communicating properly with his or her partner (meaning that the operator is not listening to his or her partner’s guidance). If this occurs, the potential for injury, to both firefighter and patient, increases tremendously. The pictures below illustrate improper technique followed by the simple solution. 2 In the picture, the entrapment danger is no longer present because of a simple re-positioning of the hand. As mentioned in the first rule, the hydraulic tools we use operate at extremely high pressures. Most cutters use anywhere from 50,000 to 300,000 psi of force, some times more, to cut through the exotic metals and reinforcing posts in vehicles. Spreaders use anywhere from 30,000 to 70,000 pounds or more of pressure per square inch when spreading. Often times, the spreaders can lose their bite on the vehicle, and when this happens, the tool can recoil with tremendous force. When a vehicle is involved in a crash, the forces exerted on the vehicle are also extreme. The cutter can recoil once it has finally cut through metal, usually with less force than that of the spreader. However, if an operator is leaning against the tool with any part of his or her body, the tool can recoil into that body part. The resulting forces can easily damage soft tissue and break bones. The best method to protect the tool operator is to get a good bite on the vehicle with what ever tool is being used, then move out of the recoil zone and at safe angle from the tool. The previous picture shows the fire fighter doing this. 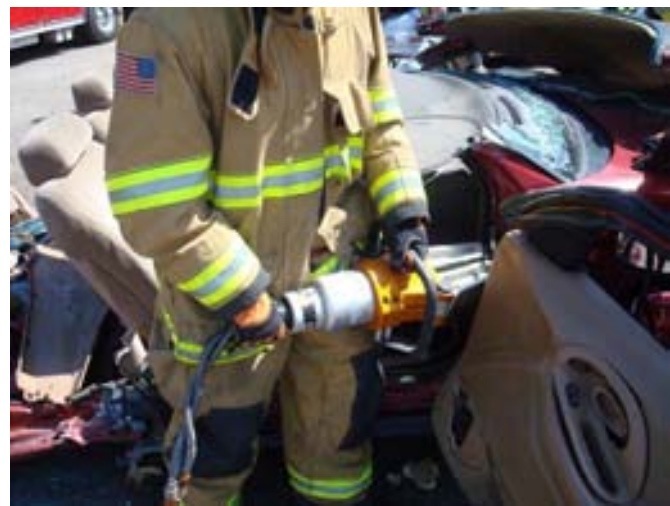 Our hydraulic extrication equipment is very powerful tools. With that being said, the strength of a fire fighter contributes very little to the effectiveness of extrication operations. The tools are doing the work for us. There should be no need for us to manhandle the tools once they have gotten a bite, nor should we use our hydraulic tools as battering rams as a means to accomplish our mission. As firefighters, we need to understand that we are the brains of the tool and that our muscles, no matter how big and strong, should only be used for us to place tools in the correct spot. Also, remember that the patient we are trying to rescue has just been through a violent vehicle accident. The last thing that they need to hear is someone banging and slamming tools into the vehicle. 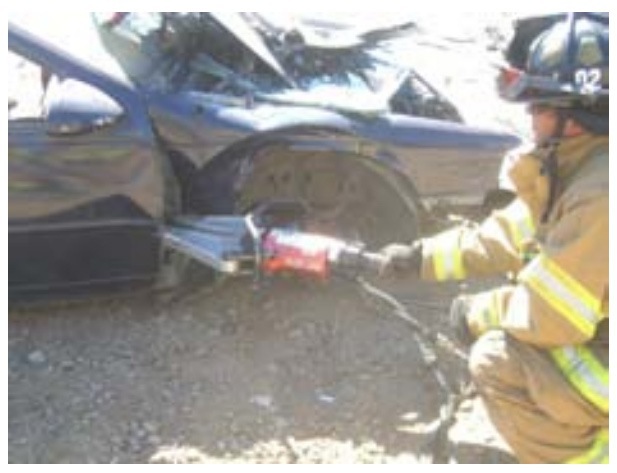 The normal sounds of extrication are amplified much more in the interior of the vehicle. Shaking the vehicle and hammering it can cause undue stress to the patient, making them to react in an adverse manner. Remember too, the position of some vehicle airbags and sensors. One well placed hit into the door of the vehicle can cause a live airbag to deploy into the patient. This rule serves two purposes. The first is to protect the firefighters from back, shoulder and other injuries that could occur due to pushing, pulling and slamming of the tools. Back injuries are the most common injury in the fire service and any methods that can minimize these injuries must be utilized. The second is to conserve the firefighter’s energy for the rest of the emergency and the rest of the shift. This is vital during the heat of the summer months, or if we must perform multiple extrications at one incident. 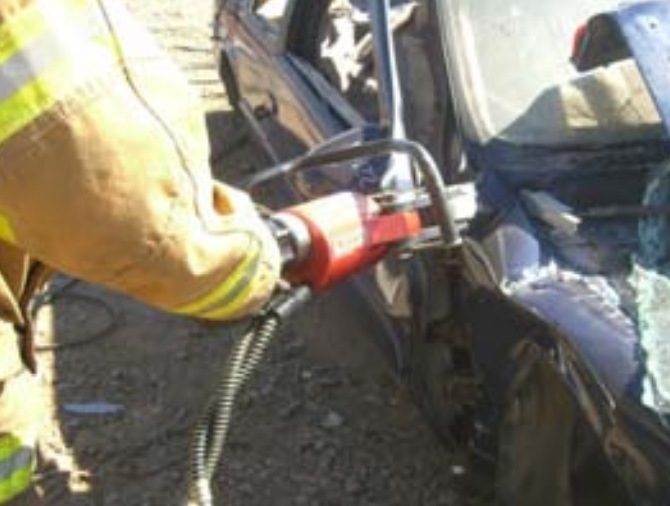 Extrication operations can be very tiring, especially if the fire fighters operating the tool are constantly fighting or trying to manhandle the tool. The less experienced fire fighter is usually the first to become exhausted, however, more experienced fire fighters can succumb to the emotional aspect and stresses of a call and also over exert themselves. The only effort that the fire fighter needs to exert is the initial effort of getting the tool into position and on its initial bite. Once the tool has its bite, whether using the spreader, cutter or ram, the operator should be able to step back out of the recoil zone and operate it with one hand. We, as rescuers, are here to place our tools in the correct spot, operate them efficiently and adjust the operation as necessary. The tool is there to do the dirty work. WE THINK FOR THE TOOLS, THE TOOLS DO THE WORK!!! 4 Above, the entrapment danger is no longer present because the firefighter repositions his/her body away from the vehicle. It is very easy for any body to get sucked in by “Candle Moth Syndrome” where we focus all of our attention on the task at hand and forget about the bigger picture. When we are working a tool it is also very easy to come up with a plan, not see ineffectiveness of that plan and continue on without being able to adapt. This is one of the reasons why we have a partner backing us up. It is amazing how much more of the incident can be seen by simply moving a foot or two back from the actual work. The backup partner should be able to see the bigger picture and notify the tool operator of any dangers of the current operation or if the plan is ineffective. For this reason, it may be more effective to have the more experienced fire fighter as the back up and have the less experienced fire fighter working the tool. With experience, firefighters should be able to remain calm during an intense situation, thereby allowing the less experienced rescuer to draw on that calmness. The fire fighter with more experience should also be able to adapt to adversity in plans much easier and then utilize any backup plans that they have in their mental tool box. 5 The picture on the left shows the initial effort of placing the tool in the correct spot. The picture on the right shows the operator achieving a good bite and working the tool with one hand. This most basic part of this rule deals with first part of any extrication – Try before you pry. Too many times we concentrate all our forces and energy one side of the vehicle when all we need to do is open the door on the undamaged side. The vehicle is giving us an option that is far less labor intensive, so why isn’t our first option to try to open the door on the undamaged side. Just because we have extrication tools doesn’t mean that they present the only method of removing a patient. On a different scene, you may have one rescuer who prefers to remove a door from the hinge side and tends to use that method exclusively. However, the next vehicle that he or she approaches may only allow access from the Nader pin side. On another incident, because of the damage to the vehicle or its construction, a dash lift may be ineffective, requiring crews to employ the dash roll evolution. This means that when it comes to extrication, we must be proficient in as many techniques as possible. We may not be able to use our preferred method of extrication on every vehicle, but having more options available to us only increases our chances of extricating patients in a timely and safe manner. We must also look for and exploit the weaknesses that our vehicle gives us. Stay away from the reinforced areas of the vehicle; attack them only if absolutely necessary. On the simpler side, instead of placing the tool in a certain spot that may not be the most effective, the vehicle may give us an opening, that by simply moving the tool a few inches or changing the angle of attack, allows us to accomplish our task much easier and safer. Choose the simplest method first and then, if needed, progress to the more difficult evolutions. 6 In this pitcure, the fire fighters have achieved a strong, solid bite with the tools, are expending less energy and are now able to operate the tool with one hand. Doing this also allows emergency personnel to distance themselves from the recoil zone of the tool. Firefighters are not the only personnel susceptible to the Candle Moth Syndrome. Sector, company and command officers may also fall into the trap when dealing with tactics and strategies. So it becomes extremely important for company and sector officers to develop back up plans in case the initial plan does not work. It is better to have these plans ready for implementation versus finding out late in the game that your plans aren’t working. Knowing that firefighters don’t like to lose at anything, we tend to try the same technique or plan of attack far longer than necessary. This will not only affect the patients overall outcome, but it can also endanger everybody involved in the incident. We’ve all heard it or have even said it ourselves sometime in our career, “Gimme five more minutes” or “I’ve almost got it, I’m gonna get it this time”. Again, nobody is immune; it can happen to the best of us. However, the person who already has a plan B and C ready for implementation tends to have the ability to see the ineffectiveness of a plan sooner. This person will also find it easier to abandon the current attack and move on to a different, perhaps more effective, plan of action. This is part of the constant evaluation of the situation that all personnel, especially supervisors, should be doing on the scene of any emergency. 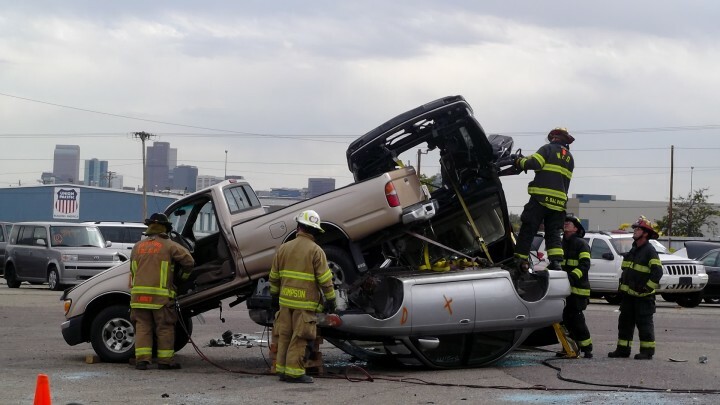 The Golden Rules of Extrication were created in an attempt to keep fire fighters from injuring themselves and their patients, and to increase the effectiveness of extrication operations.